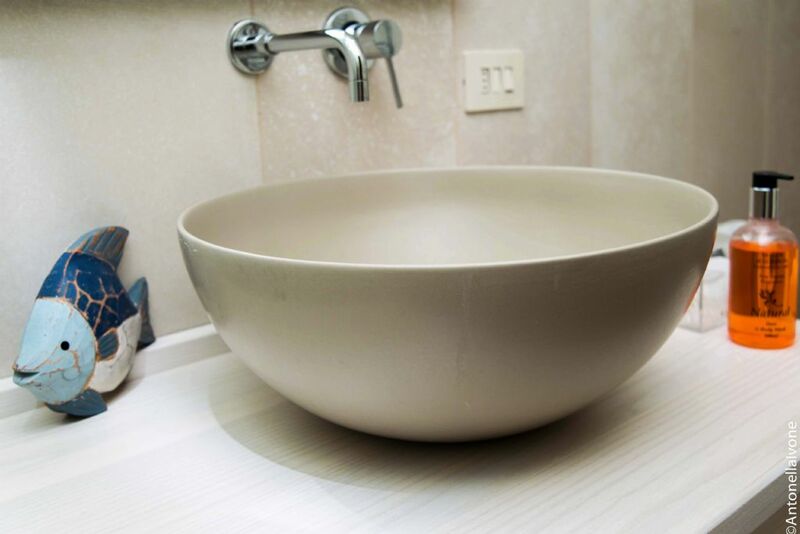 Welcoming at any time of the day or night! 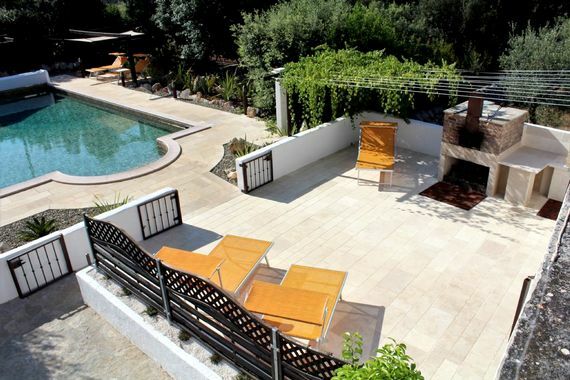 Stunning heated and gated pool, 12 x 6 m with Roman steps, great for the little ones! 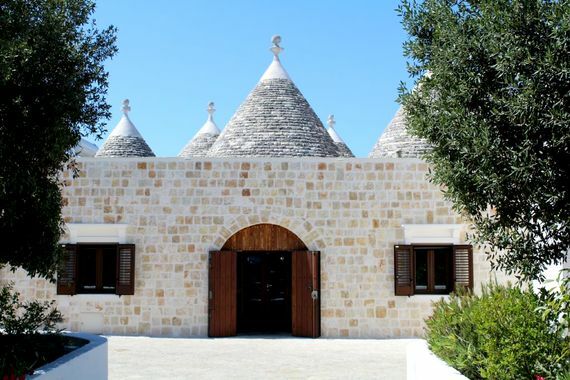 The Trulli houses of Puglia are the kind of place that a hobbit might feel at home but Trullo Negli Alberi would ‘truly’ be a palace, (excuse the pun! ), among these unique architectural curiosities. 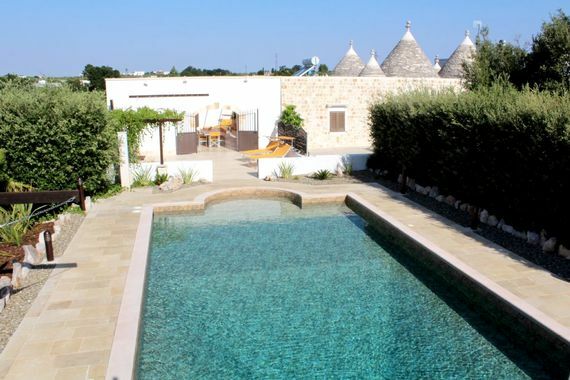 This Trulli villa has no less that seven of the characteristic, bee-hive like cones poking out of the roof and beneath four of these are four lovely bedrooms (with air-con), with exposed stone walls and ceilings circling up to their pointy pinnacles. The living room also has the same stone archways and ceiling with funky red leather sofas providing a splash of Italian designer style. So the Trullo has bags of character but it’s also been lovingly renovated by British owners, Alison and Chris, as a luxurious villa, where up to 9 family and friends have absolutely everything they could wish for. Of course the Trullo has a private heated pool and measuring 12m x 6m, with Roman steps at one end for easy access by little ones and pool inflatables provided. A lockable gate ensures toddlers can’t just totter through unsupervised and sail canopies provide welcome shade over outdoor bean bags and sun loungers when temperatures start to soar. 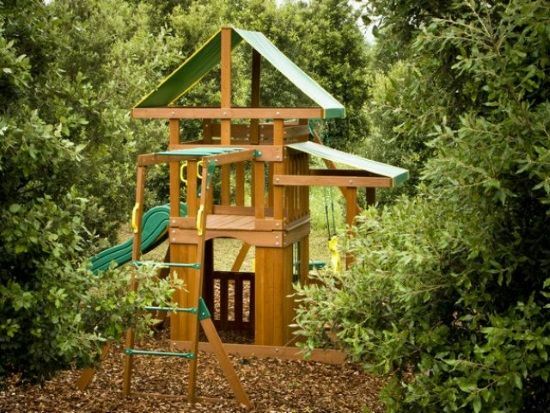 Besides having fun in the pool, little ones can safely play in either the enclosed courtyard or games room, with a play house, a push-along walker, rocking horses and a paddling pool, all generously provided by the owners. 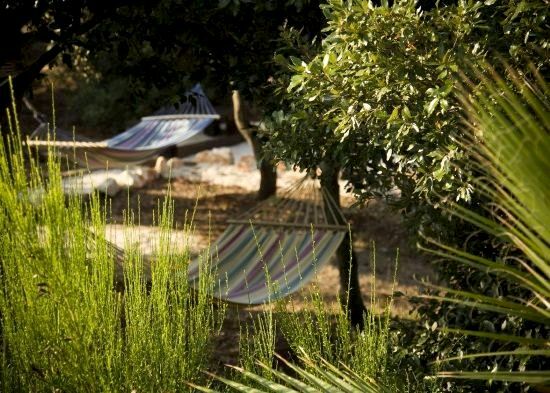 Children can also explore the grounds and discover a petanque pitch and play frame tower with swings and a slide, or simply hang out in hammocks slung between the oak trees. As if all this wasn’t enough to keep children happy, the icing on the cake at Trullo Negli Alberi is a fab games and cinema room where parents might lose kids for most of the week! Traditional games include a pool table, table tennis, table football, giant Jenga, giant Connect 4 and a darts board and then there’s a Wii console and Playstation 2 console with games, plus a 42" plasma TV with over 3000 films on the hard drive cinema system! 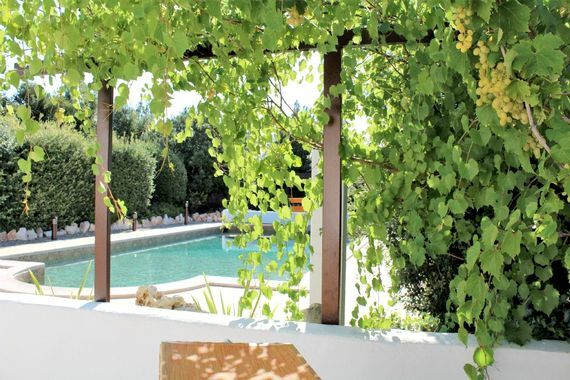 With the children busy as bees having fun, parents can completely chill out and enjoy delicious food, in good company, in the southern Italy sunshine. Puglia is renowned for some of the best traditional food in Italy, not to mention the Pugliese wine, so a quick trip to one of the local towns to stock up and that’s the grown-ups sorted. Besides sizzling up the fabulous local seafood and lamb on the barbecue, one thing that is sure to get the kids back for dinner is homemade pizzas baked in the outdoor wood fired oven, perhaps with the local ‘little ears’ orecchiette pasta on the side. 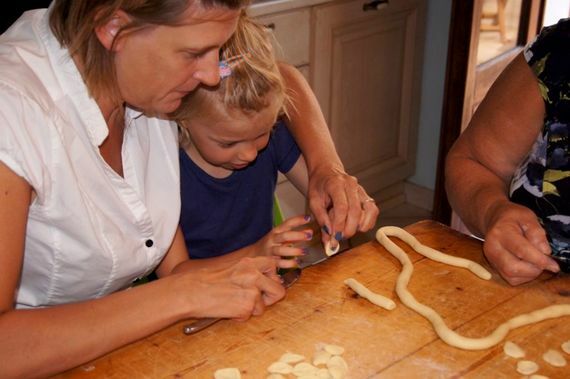 To combine a bit of fun with yummy food, the owners can also arrange pasta making evening at the Trullo with a friendly local lady who really knows her stuff, or a pizza making evening where kids can make up their favourite weird and wonderful creations. 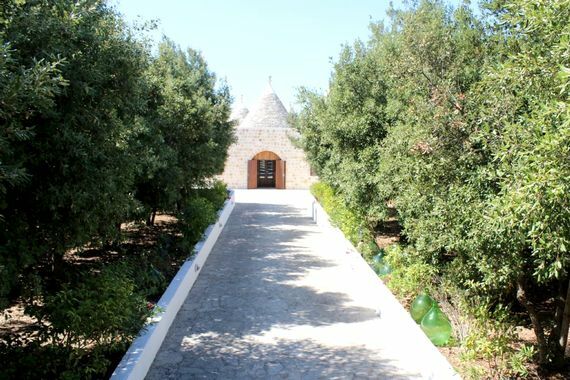 Trullo Negli Alberi is a large, traditional stone villa, with the distinctive conical roofs that are a quirky characteristic of this part of Puglia. The villa very comfortably sleeps up to 9, with up to 3 babies in cots and/or one toddler in an infant bed. Two travel cots and one wooden cot are provided and three of the bedrooms have space for a cot within them, whilst the master suite has space for all three, or a cot and a small toddler bed. 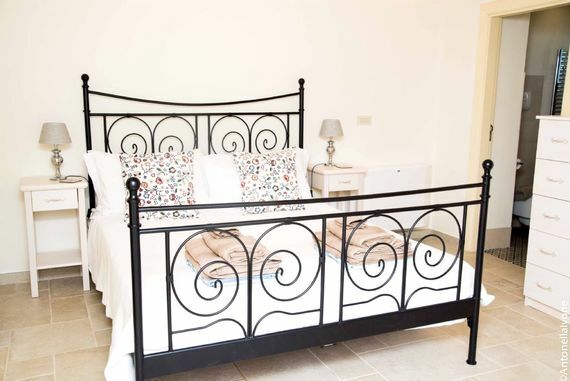 The master suite has a wrought iron double bed, a sofa that converts into a single bed and an ensuite shower room. The second bedroom, with an original fireplace, also has wrought iron double bed, space for a cot, and a luxury ensuite shower room. The remaining two bedrooms both have twin beds that can be set up as a king-size double and one of these has an ensuite shower room. 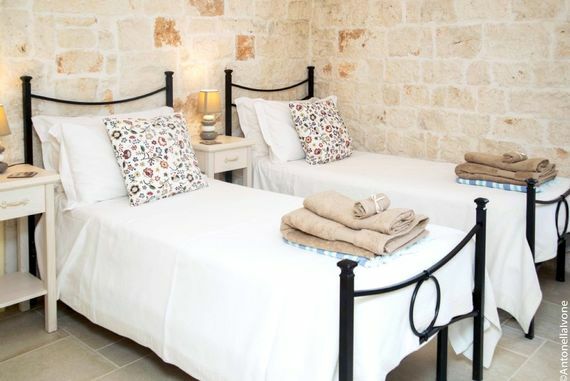 Each bedroom has its own iPod dock and a TV for playing DVD’s, with a large collection at the Trullo to choose from. 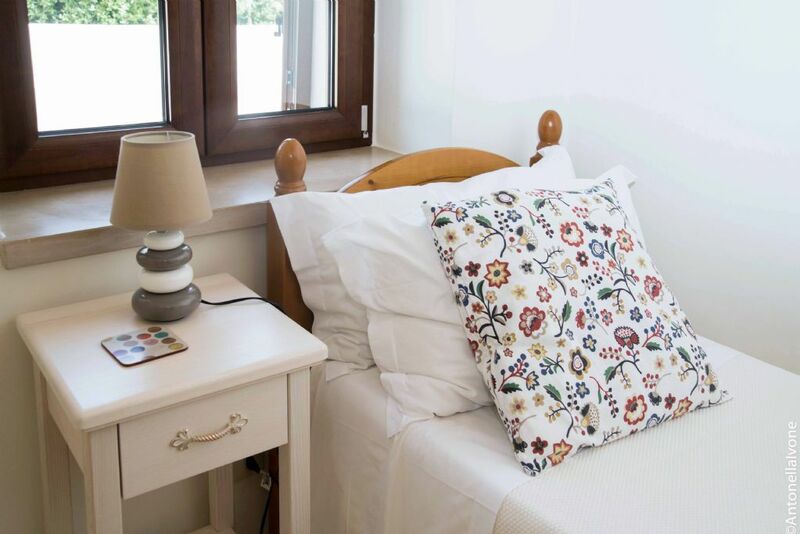 The bedrooms also have double glazing and shutters to stay cool or cosy and get and good night’s sleep. 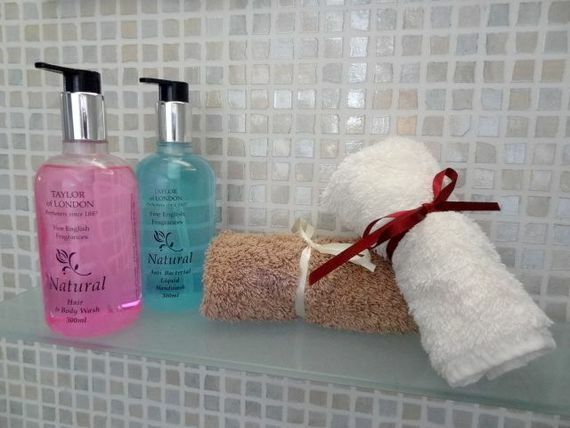 All the ensuite shower rooms have been finished to very high standards, along with the family bathroom, which has both a bath and a shower. The large sitting room has all the character of a traditional Trullo, with a stone ceiling, and families can settle down into a pair of red, Italian designer-style, leather sofas to watch satellite TV or DVD’s, or stream games and movies through the WI Fi. 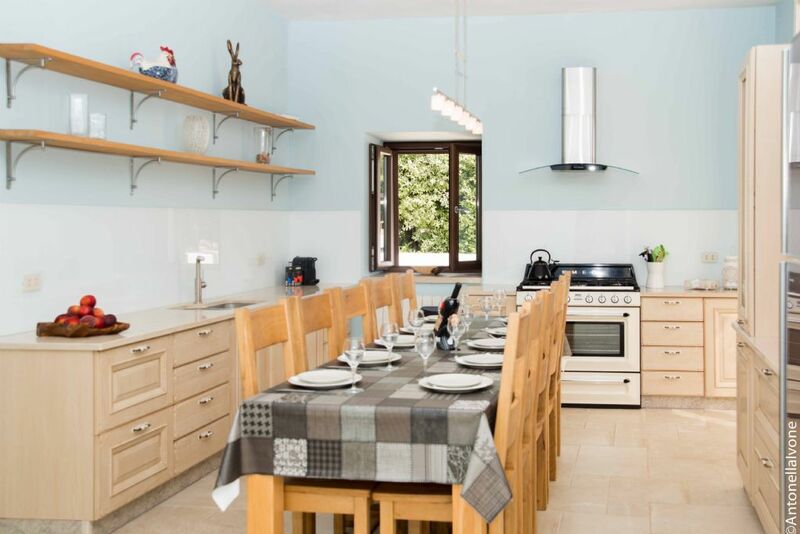 The modern dining kitchen is well equipped for cooking up Pugliese feasts, including a large oven and 5-ring hob, microwave, fridge/freezer, dishwasher, coffee maker, drinks fridge, bottle steriliser and washing machine. There is also a handmade ash dining table with seating for 10, plus 3 high chairs are available. 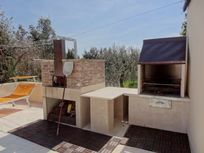 For eating al fresco there is a sun terrace with stone dining table and chairs to seat 10, a barbecue and wood fired pizza oven. 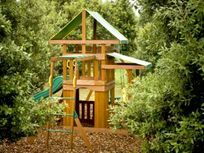 There is also an enclosed courtyard where children can play and a garden of oak trees, with a play frame, petanque pitch and hammocks. The private heated swimming pool has a lockable gate and there are 12 sun loungers, big garden bean bags and sail canopies for shade. 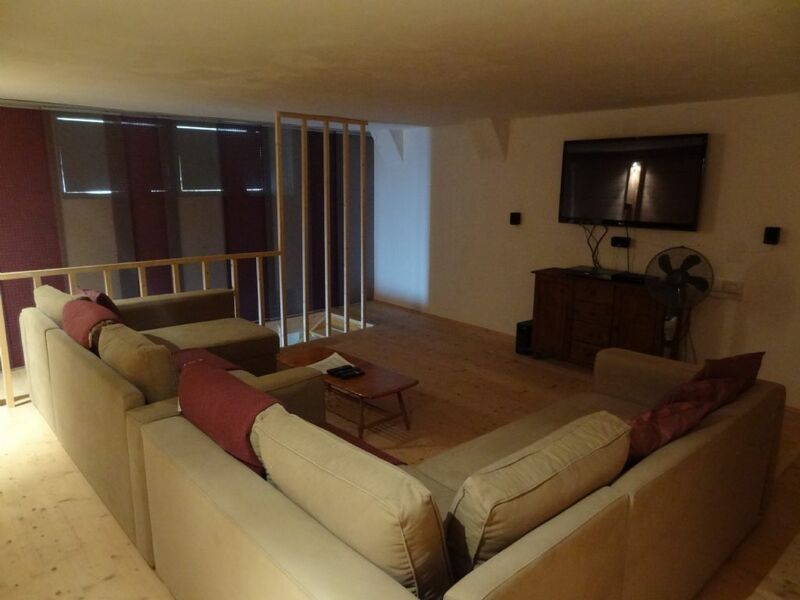 The Trullo also has games and cinema room with a table football, a pool, table, giant Jenga and Connect 4, plus a Wii and Playstation 2 with games and a 42" plasma TV with over 3000 films on the hard drive. 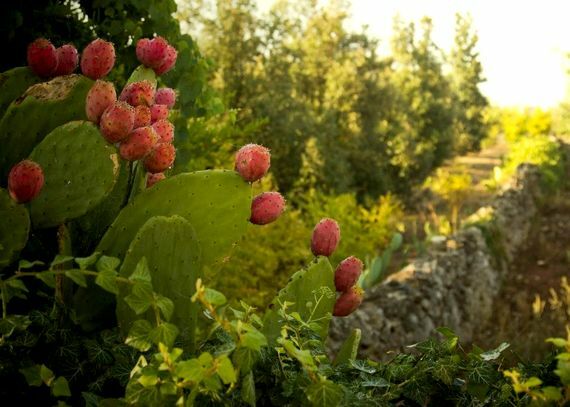 When the owners, Alison and Chris first came here in 2005 they immediately fell in love with this corner of Italy and within a few years just had to make Puglia their home. Way down in the heel of Italy’s boot, Puglia is one of the most unspoilt regions and still amazingly undiscovered, with whitewashed towns perched on the hilltops and a pretty coastline of fishing villages, coves and beaches. So renowned is Puglia for its array of home grown produce that its known as the bread basket of Italy and from simple pasta with rich vegetable sauces to Italy’s finest fish and seafood, foodies are in for a treat. 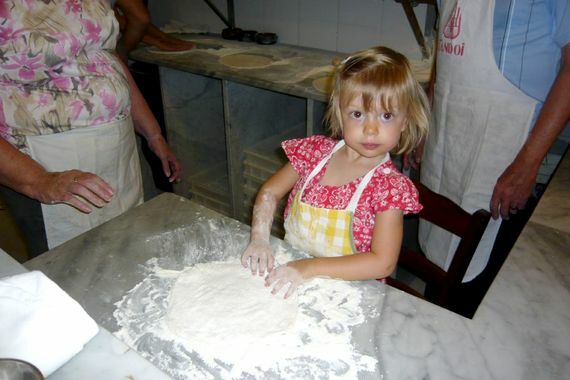 The owners didn’t just fall for Puglia but also the incredible friendliness of the people and every evening entire families take a "passeggiata" around the towns, to meet up and chat to friends while children play in the quiet streets and squares. Guests at Trullo Negli Alberi can discover the pleasure of the passeggiata in the nearby little town of Locorotondo (3kms) which has many pavement cafes and restaurants which are always family friendly. The nearest restaurant is just 1km away from the Trullo along with a handy little supermarket, the route is an unpavemented lane and it can be very dark at night so we wouldn't recommend walking with a buggy. 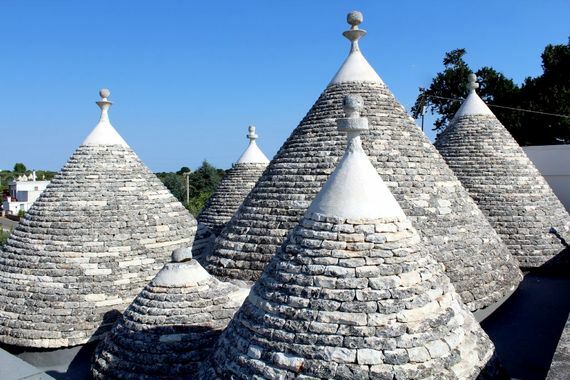 The 7 conical towers of Trullo Negli Albero are the bee-hive like structures that appear throughout Puglia and no more so than in the nearby town of Alberobello (5kms). With over a thousand Trulli, built hundreds of years ago, Alberobello has been designated a UNESCO World Heritage Site and it is a delight to wander around the charming streets. Although some of the Trulli are still homes, many have been converted into shops, galleries, cafes and trattorias which make this pretty town somewhere really quite unique. Quiet cycle routes make a pleasant way for families to visit both Locorotondo and Alberobello, and there are 9 bicycles of different sizes, to borrow at the Trullo. Besides exploring the pretty hilltop towns, the Trullo is just 15kms from the coast, strung with secluded coves, sandy beaches and traditional fishing villages with quayside restaurants serving the most delicious, fresh caught fish and seafood. 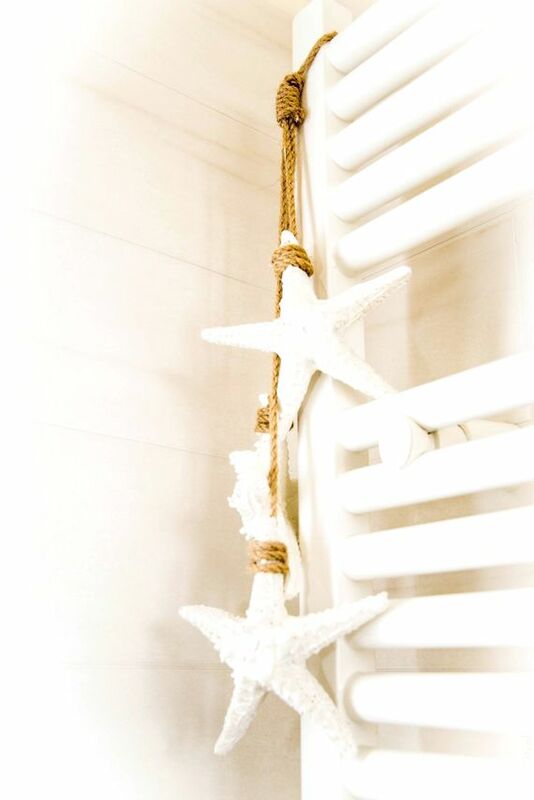 The nearest sandy beaches of Torre Canne and Savelletri are just a 20-minute drive and away. Getting here: The nearest airports are Bari and Brindisi which are both approximately 80kms (1 hours drive). BA, Easyjet and Ryanair fly from the UK to Bari and Ryanair and Easyjet also fly directly to Brindisi. 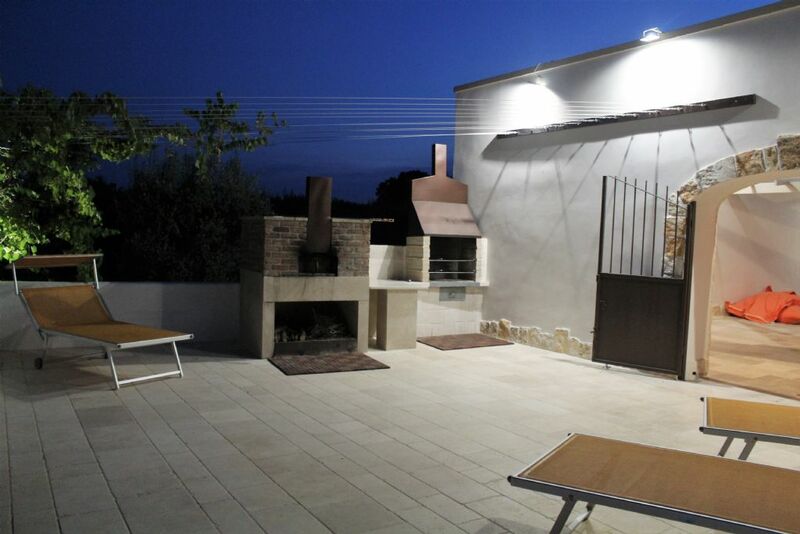 We bought the trullo 10 years ago as a holiday home and have really enjoyed it. 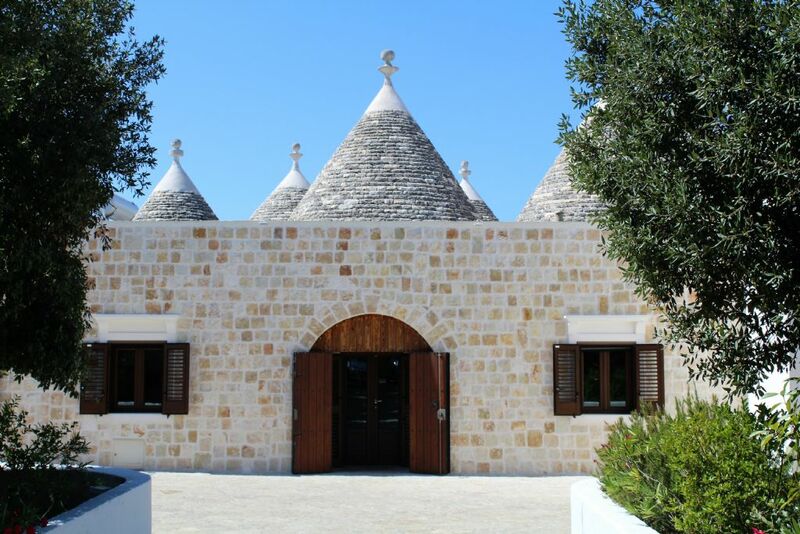 We believe on upgrading the trullo every year and keep on top of all the maintenance, so that when we and guests go there they have a great time. 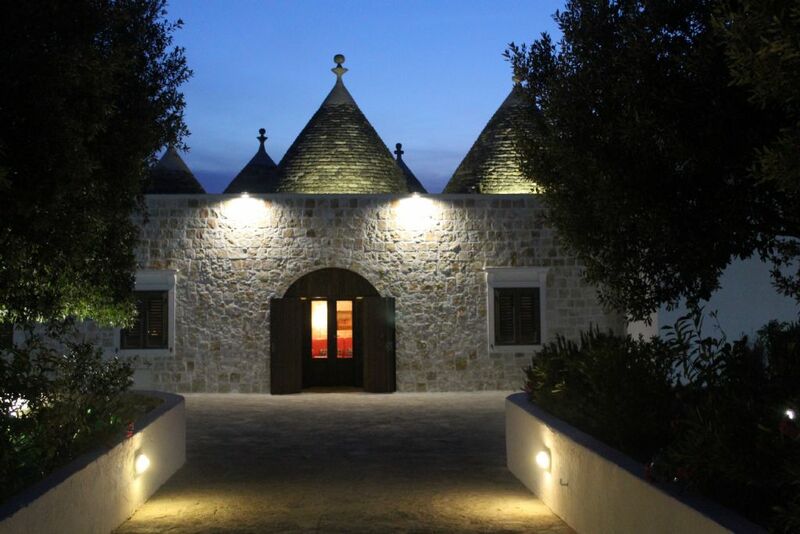 We really do take great pride in presenting the trullo to the best of our ability. 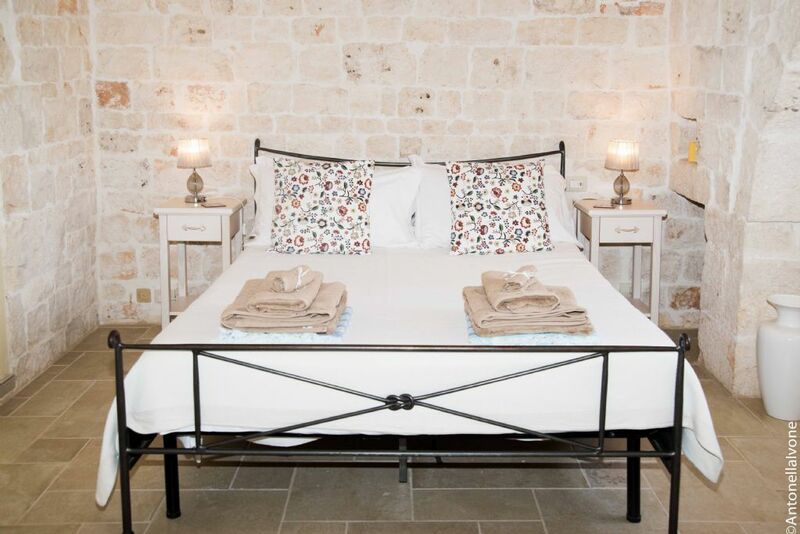 We love going on holiday to our trullo. We have really tried hard to put everything into the trullo that we can think of that a child might want/need on holiday. We have a young daughter and I remember one time when she was about 6 months old we were going to friends who didn't have a child and so we had to take everything, the cot, high chair, rocker. In the end we just couldn't fit it all in and we had to take the van instead of the car! I can't imagine what we would of done if we had to have fit everything into a case. 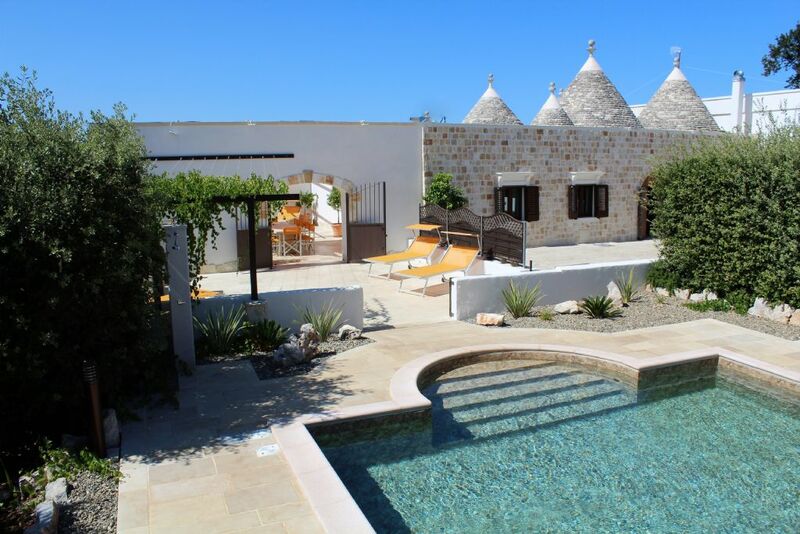 Kids love the trullo mostly because of the pool, and being heated they don’t turn blue and can stay in there all day! If they do get bored then there is the large games room with lots of books to read but which of course they completely ignore and play on the Wii or PlayStation! Bari and Brindisi both 70KM drive away. A sandy beach can be reached within 20 minutes drive. A convenience store can be found 1km walk away from the trullo but not recommending for walking with a buggy as there is no pavement. 12 x 6m outdoor heated pool which is fenced and alarmed, and has Roman style entry steps. Two travel cots, one with changing facilities, 1 wooded cot, one other changing mat, three high chairs, baby rocker, baby monitor, steriliser, bottle warmer, three night lights, three bed guards, toddler bed, plastic plates, bowls, cups & cutlery, and a blender. U rated DVDs, touch and feel books, books, games, and general toys. Pre-arrival shopping and catering can be arranged. Large play frame with three swings, one bucket seat for toddler, slide, monkey bars, 2 play houses, ride on truck, bicycle with stabilisers, paddling pool, push along walker, 2 rocking horses, one large and one small, and inflatables for the pool. Spa therapist can be arranged. 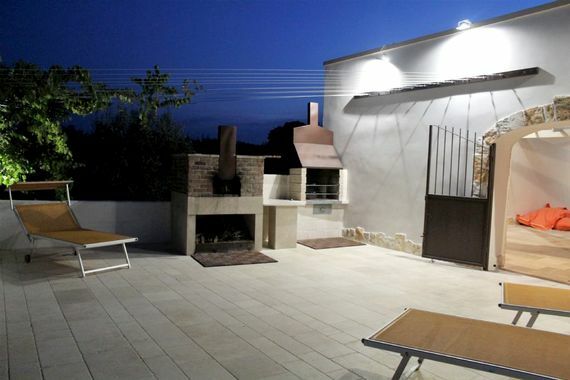 enclosed courtyard with a BBQ and a pizza oven within the grounds. Golf course can be reached in 30 minutes drive. 3 highchairs and 3 cots are available. 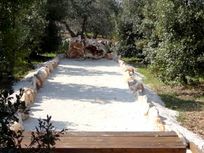 We enjoyed a lovely week at Trullo negli Alberi at Easter time. Alison and Chris were very responsive from my first inquiry which led to a smooth booking process and responses to all of my questions. They have thought of everything and the Trulli is well equipped with many of the home comforts missing in other villa / holiday home rentals. The outdoor space is gorgeous with a lovely pool, outdoor playground and sitting areas and our kids loved the freedom to play outside and we enjoyed the ability to sit and read while they did so. The kitchen is well stocked and very comfortable for cooking. Alison and Chris helpfully provided some starters which was much appreciated after our journey. The bedrooms are all very comfortable and again well stocked with bedding, towels etc. From a young one's standpoint, the piece de resistance is the indoor playroom where our kids spent hours playing with the toys and games. Adults will enjoy the movie room with lots of options. Alison & Chris provided a really helpful guide to the surroundings and we followed many of their suggestions for days out, markets and restaurants. 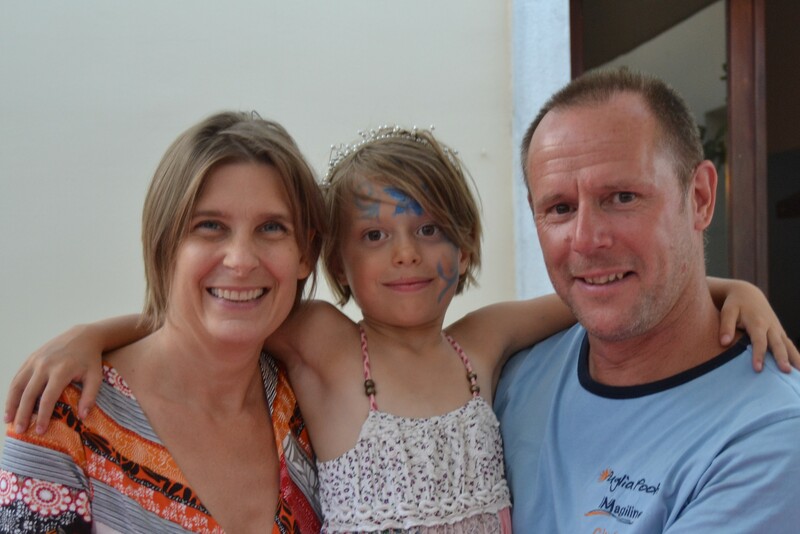 Thank you for a fantastic family holiday!